318 pages | 2 B/W Illus. Every year thousands of people compete for employment in the UK. Employability and the ability to demonstrate the skills, attributes and behaviours required in a full-time job have become integral to securing employment and developing a career. This book aims to offer a one-stop guide to becoming employable and to careers in the Criminal Justice Sector and beyond, exploring the key organizations and employers in England, Wales, Scotland and Northern Ireland, explaining how they operate and detailing how they are changing. Packed with hints and tips, advice from current students, useful web links and lists of recommended reading, this book provides a clear guide to the career decision-making and transition processes and covers the essential elements required to making the first step towards securing a job in the above sectors. It will be essential reading for those who want to forge a successful career in any area of the Criminal Justice Sector. 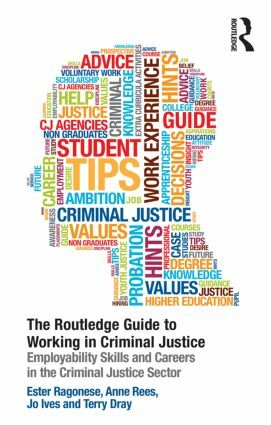 ‘This book is a very welcome resource that will be helpful to students, educators, careers professionals and those in the early stages of criminal justice careers. It is comprehensive, informative, accessible and very thoroughly researched. The book is organised in a very user-friendly way, with the reflection points, action points and mini case studies being easy to find and helpful to the reader’s practical understanding of the routes into criminal justice work. 1. Introduction to the book 2. Introduction to The Criminal Justice System 3. Routes into Criminal Justice Careers 4. Becoming Employable 5. Working in Probation 6. Working in the Police 7. Working in Prisons 8. Working in Courts, Prosecution Services and Advocacy 9. Working in Youth Justice 10. Alternative Options: Pursuing Other Careers in Criminal Justice 11. Final Thoughts: Moving Forward and Developing a Successful Career. Ester Ragonese is a Senior Lecturer in Criminal Justice in the School of Law at Liverpool John Moores University. She spent the early part of her career working in the probation service as a probation officer and prior to her appointment at John Moores, she was a lecturer in Probation Studies at Liverpool University. Ester has a particular interest in issues relating to diversity/ inequality in the criminal justice system, the management and treatment of drug users, the homeless and the practice of punishment. More recently, Ester has developed an interest in the issue of employability and, within her team, takes the lead on this area. She is currently the module leader for a module which focuses on Professional Development within Criminal Justice. Anne Rees isa Senior Lecturer and Regional Tutor for the Institute of Criminal Justice Studies at the University of Portsmouth. She has been involved in the development and the delivery of the Probation Qualifications Framework. Anne has been teaching in higher education for over 10 years and prior to this she had developed a rewarding career in the Merseyside Probation Service. She held a range of positions including: Probation Officer, Acting Senior and Practice Development Officer, where she then developed the role of lead trainer in the roll out of OASys in Merseyside Probation. Anne’s areas of specific interest include Risk Assessment, Dangerousness, Drug Misuse and Mental Health. She continues to be involved in the front line services as a volunteer Panel Member with the Merseyside Youth Offending Team. Jo Ives is Deputy Director of the World of Work Centre at Liverpool John Moores University, with over 30 years of teaching experience in secondary, further and higher education. She is a Senior Fellow of the Higher Education Academy. Jo has presented at many international conferences and works as a consultant with Universities and Ministries of Higher Education in developing and delivering support for senior managers, assisting the Higher Education development and implementation of Graduate Employability models in Malaysia, Jordan, and Egypt and, most recently, in universities in Morocco and Tunisia. Terry Dray is Director of the Graduate Advancement, Employer Engagement and Alumni Relations at Liverpool John Moores University, UK. He started his career as a police officer and has worked in higher education for 20 years, holding management positions at Oxford University, where he was Director of the Career Service, Warwick University and The University of Manchester. He provides consultancy and training for universities and government departments across the world and particularly in North Africa, the Middle East, Malaysia and the U.S.A.